We sincerely regret to hear that this was your experience. We understand that we have spoken to you in regards to your listed concerns. If you continue to have questions please contact us at customersupport@empiretoday.com. In May empire today had a 50/50/50 sale so I call & set up appt. Salesman showed up next day, showed me samples, most of which are ugly. I found only 1 thank looked good & the sales rep told us that it was stain proof & waterproof. I looked at the backing of sample & sure enough it was sealed. He said it would be great for my grandchild in that "With the thicker padding they were "throwing in" it would Never leak through. So, we set up install for the next day. The in stalkers came, only one spoke slight English, they got the job done fast. It looked really nice! The guy told us the smell goes away after a few days. They left behind a Pile of carpet and padding, said they'd come back from Chicago to do our stairs, & told us that he keeps the carpet in his garage. We thought that odd! Anyway, in our remodeling endeavor, nobody came back, we called & got no response, can't get answers. No Salesman contact & only 3 names if National contacts; Vicky, Helen & ? another female that deals with online complaints. My NEW carpet began Stinking WORSE!! I thought it was because I quit smoking & maybe my nose changed but not so. I began calling guard in August, even though I'd been sick & in/out of hospital. We had to have carpet cleaners come in because that smell was indeed drawing my cat to urinate. The smell is on the outer perimeter off the outer part of carpet roll. The calls continued as did the pee, Smell, enzymes, carpet more cleaning. After I posted on Yelp, I got a call from this Helen Brown (Not Real Names) Now they want to work with us? Hmm.
. My basement smells so bad and Empire Today will not do Anything till I sign a "Standard" form "Agreeing to Pay Them an Additional $400 to remove & replace. So Now, I'm in the hospital, come out & they ate dealing with my husband who thinks, as I do, that it Should Not cost us ANY more money. Plus, the "Standard Agreement" is actually a Release of Liability which is ***!! I ended up having to leave my home to heal from surgery. Came back & on October 9th, they sent out the Same Old salesman with new samples. ( Our Color has been discontinued) So, I choose 3 different ones to be submitted. He Refused to give me pricing on ANY of the product( & as of November 12, I still has No Actual receipt.) Anyway, he said he would submit are choices & someone would contact us. On October 11th I had to again leave my home due to the smell & the damage it's doing to me trying to clean it, what it's doing to my walls, and the smell that has permeated to the up stairs. Came back to my home, called got Market, in Texas on 11/10/14 & I'm Mad! I was going to remove this carpet myself due to the unsanitary smell & health hassards Empire's carpet is causing. I read my warranty only to find that I would VOID warranty if I remove myself. I told this to Arlet who kept putting me on hold. She found notes if 2 call attempts that Empire made while I was out of my house. I bitched so much about this problem since it's been 5 1/2 months. She left a message to "HELEN BROWN?" regarding my demands of removal. So, Today, Empire Today (Helen Brown(called my husband) saying that they will NOT Remove UNTIL They get the Letter of Release/ Hold Harmless & $400.00 more. I Flipped! I have Health problems, Carpet is causing Breathing problems & I'm Friggen being BLACKMAILED & Held Hostage by these SCAMMERS!!! WTF?? My husband is having them send the waiver & I'm calling a lawyer & a news station! 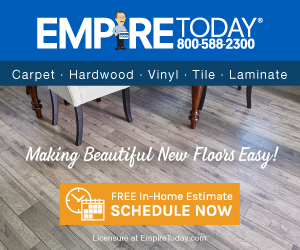 This Empire Today Carpet company is Horrible bunch of LIARS! I demanded to speak to Helen's Supervisor & was refused. I tried finding Corporate contacts online only to find names, possibly Fake too!, with no contact information. I am Certain that this company is hiring illegals & carpet/flooring materials come from any close by garage or storage facility. The salesman is useless & lies and Nobody gives you pricing on anything to show before/ after sale costs. And Now, I have spent OVER $400 on Carpet Cleaning, carpet cleaners not to mention the HOURS/DAYS lost to Empire selling us Damaged Carpet that I've had to leave my home, can't bring anyone in due to the smell that Literally will take your breath away. EMPIRE TODAY Is not Worth the lower cost if you EVER Need Customer Care! When you do, This is when you'll find out that they, Empire Today, ripped you off! I would NEVER recommend this place not even to an Enemy! Preferred solution: I want the soiled carpet removed/replaced! I Shouldn't have to P $400.00 More to Empire Today, I want Empire Today to Refund the costs of Carpet Cleaning, Solutions & if this doesn't get resolved now, I will go to court for damage being done to my drywall. I didn't like: Empire today, Salesman, Being blackedmailed, Empire customer service, Being ripped off, Having my basement stink, Getting sick due to smell, Lack of caring. Review #557088 is a subjective opinion of User557088. As a former emplyee from Chicago.... youre correct its the biggest scam in the world. Hi Heather, thank you for making us aware of your concerns. We can assure you that we are taking this situation very seriously, and we understand that we have been in contact with you and are in the process of working towards a resolution. Please don’t hesitate to contact us with any additional questions or concerns.